Detail of recovered stage backdrop. The Town Hall is a big patchwork of a building that has acquired its layered style, quality, and details over its long existence. Maintaining this inherent character is a challenge, but we welcome the chance to highlight — and contribute to — the life and the spirit within these walls. Often we encounter surprises and mysteries, and occasionally make remarkable discoveries. One neighbor, a professional electrician who volunteers time here, knew that the Hall was once a barn-like, gabled building. But as she climbed into the front part of the attic with a spotlight, there before her was the original gable, its siding and trim still intact. "It was like seeing a friendly ghost...almost like it was saying 'Hello, and welcome!" Other bits and pieces of the past have likewise been encountered — an advertisement for a long-ago event painted on a board inside a wall, and a huge, hand-painted stage backdrop with signatures of the high school students who probably created it for a school play. Removal of the advertisement might have destroyed it, and the workers chose to photograph it and leave it in place, possibly to be discovered by a future crew. But the backdrop was carefully removed in pieces and stored, to be reinstalled at the stage’s rear wall when Rejuvenation is complete. And plans include exposing a glimpse of the original facade's gable as well. 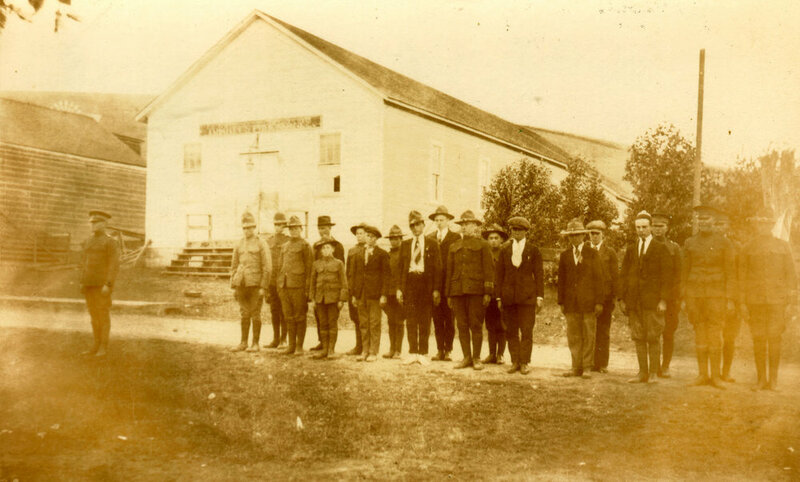 Original Town Hall with WWI ROTC soldiers, c. 1917. Sign discovered inside stage wall.